Happy Halloween Tutorial Tuesday. 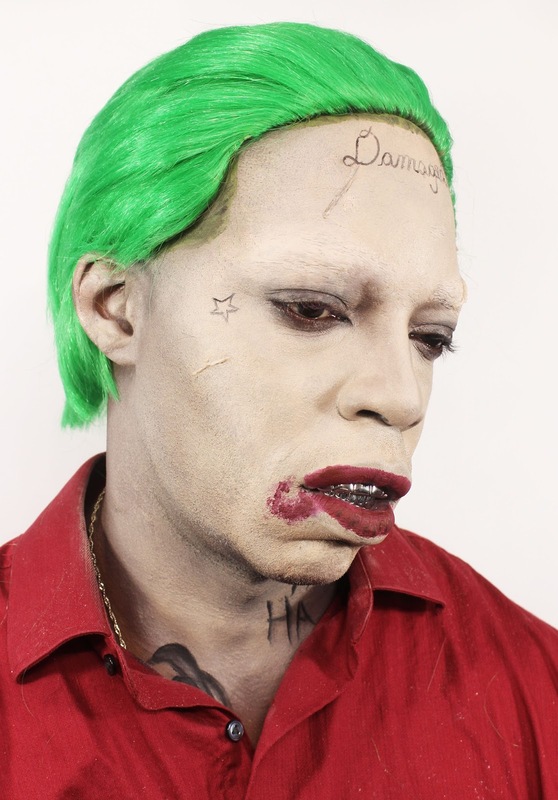 I know it's cliche, but I couldn't do my last Harley Quinn makeup tutorial without doing Joker. This isn't my first Joker. I did the Heath Ledger Version back in the day, but the Suicide Squad Jared Leto version is a lot different. My amazing husband volunteered to be my model and boy was this makeover a challenge. See how I turn my husband into a white guy! The new Joker doesn't have white clown paint, rather he has a very pale, sallow complexion. My husband normally has very deep, chocolately skin. 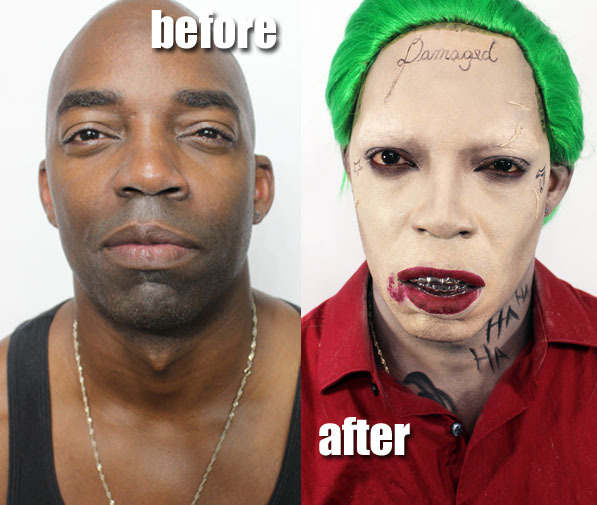 Transforming him into the joker's pale makeup was a challenge because pale foundation just looked off on him. I ended up using a pink based, medium tone foundation with spots of orange corrector to get a decent skin tone on him. I used my Temptu Concealer Wheel to accomplish this. I wanted to make the scars on this face more real. Most other tutorials I saw of this look used face paint or dark liner to create the scars. This time, I used a 3D method. I used Rigid Collodium to paint a recessed scar onto the skin. Thin layers of this clear liquid literally tighten up the skin into a temporary scar. To get a raised scar, I used 3rd Degree to make tiny silicon scars on the skin. Also key to this look are the tattoos. I would just suggest practicing on your hand. I just used Inglot Gel #77 liner to accomplish the look. The smeared lipstick is a combination of Atlantic City and Havana Nights from www.OfraCosmetics.com use coupon code MakeupByRenRen for 30% off. The green wig and silver grill are from Amazon. Hope you guys enjoyed this tutorial, one more coming this week! If you have any more Halloween requests, please leave them in the comments below!